Psoriasis, Calcitonin gene-related peptide (CGRP), Chemotactic cytokines ligand 27 (CCL27), Mitogen activated protein kinase (MAPK), NF-κB. Psoriasis is defined as a long-lasting autoimmune disease and characterized by expansion of dermal microvasculature undergoing abnormal morphological changes. The disease is not contagious but affects up to 4% of the world population  and, if progresses, it is linked to systemic inflammation and series of complications such as lymphomas, cardiovascular disorders, psoriatic arthritis, diabetes, Crohn’s disease, and depression . A wide array of therapeutic managements (e.g., steroid creams, vitamin D3 cream, immune system suppressing medications represented by methotrexate, and ultraviolet light) are widely applied to ameliorate the psoriatic symptoms [2,3], but psoriasis still remains incurable. Psoriasis is currently deemed as a genetic disease induced by environmental factors . However, the etiology and pathogenesis of psoriasis have not been fully illuminated. Among series of psoriasis-related pathological changes, abnormalities in the dermal papillary vasculature first occur, followed by the appearance of inflammatory cell infiltration and epidermal hyperplasia, leading to the progression of psoriasis. At the same time, cytokines secreted by a large number of immunologically active cells, such as T lymphocytes and monocytes, leak outside the vein into the extravascular tissue and activate keratinocyte to secret chemokines, which in turn promotes vascular abnormalities and aggravates the disease. Cutaneous T cell-attracting chemokine (CTACK; CCL27) is mainly produced by keratinocytes and an exclusive chemoattractant for CC chemokine receptor 10-positive and cutaneous lymphocyte associated antigen-positive (CCR10+/CLA+) memory T cells . CCL27 was found to markedly increase in both the intralesional keratinocytes and serum of patients with psoriasis, and its expression level was highly correlated to the severity of the disease [6,7], suggesting the principal role that CCL27 occupies in the pathogenesis of psoriasis. Clinical features of psoriasis are represented by plaque symmetry and stress-triggered development, which hint a significant part that nerves play in the pathogenesis of this disease [8,9]. Indeed, the frequently symmetrical distribution of plaques suggests that the peripheral sensory neurons may serve as important elements in a complex immunoregulatory network . Negative emotional factors such as anxiety, depression, and even marital or financial challenges can lead to the occurrence and/or exacerbation of psoriasis, indicative of a linkage of the nervous system to immunomodulatory network . In addition, dermal denervation or intralesional injection of local anesthetics mitigated psoriatic phenotype and lesions [11,12]. All these findings together suggest that nervous system is involved in the psoriatic pathogenesis. The role of neuropeptides in the development of psoriasis is revealed by substantial evidence. Calcitonin Gene-Related Peptide (CGRP) was originally deemed as a potent peptide vasodilator that functions in the transmission of pain [13,14] and found ubiquitously expressed in both central and peripheral neurons. Apart from its well-characterized role in microvascular dilatation , a battery of bioactivities have been documented in earlier publications including pathophysiology of migraine , promoting cell proliferation and suppressing apoptosis , inhibiting inflammation , and protecting against HIV infection , etc. An increasing body of evidence supported the idea that CGRP plays a striking role in the pathogenesis of inflammatory skin diseases such as psoriasis and atopic dermatitis. Since Th17 cells and interleukin-17 (IL-17) family were reported to be crucial in psoriasis onset, coupled with the preliminary work by Granstein et al. suggesting that CGRP plays a role in the preference of immune responses to Th17 pole by acting upon endothelial cells , CGRP was then postulated to be responsible for the psoriasis phenotype via this mechanism. Ostrowski et al. reported that systemic CGRP and substance P administration retarded the alleviation of psoriatic phenotype and the resolution of inflammatory cell infiltrate resulting from denervation , suggesting that CGRP and substance P might be the neuropeptide products of nerves involved in the maintenance of the psoriasis form dermatitis. Furthermore, CGRP levels in the plasma from patients with psoriasis were markedly higher in comparison to healthy individuals . Similarly, a considerable increase in CGRP level was also observed in psoriasis plaques, especially in endothelial cells from the dermal blood vessels in psoriatic lesions on their surface, which in turn contributed to the hyperproliferation of psoriasis [22,23]. These all together indicate that CGRP may feature prominently in the psoriasis pathogenesis through acting on the endothelial cells. However, the mechanism has not been completely elucidated. On the other hand, functional CGRP receptor belongs to a family B G-protein coupled receptor (GPCR) which is composed of a GPCR known as the Calcitonin-Like Receptor (CLR) and an accessory protein called Receptor Activity Modifying Protein type 1 (RAMP1) facilitating the binding of CGRP or allied peptides . Like other GPCRs, upon the activation of CGRP receptors the levels of cAMP and intracellular Ca2+ increased . It is well established that CGRP participates in various biomodulatory processes, neuroinflammation in particular, by activating multiple important signaling pathways such as Mitogen Activated Protein Kinase (MAPK) and Nuclearfactor-κB (NF-κB) pathways [26-30]. Canonical MAPK pathways are generally constituted of at least three subfamilies of MAPKs that have been well characterized, namely, extracellular signal-regulated kinase 1/2 (ERK1/2), c-Jun N-terminal kinases (JNK1/2/3) and p38 MAP kinases. However, the effect of CGRP on inflammatory cell infiltration in psoriasis is hitherto unreported. In view of this, here we determined the role of MAP kinase and NF-κB signaling pathways in CGRP regulation of chemokine CCL27. Data from our study provide compelling evidence suggesting that CGRP can stimulate CCL27 gene expression via activation of MAPK and NF-κB pathways in HaCaT cells, which will therefore help us, at least in part, to gain new insights into the mechanism underlying the crucial part of CGRP in psoriasis pathology. This study was conducted in the Life Sciences Research Centre of Taishan Medical University (Tai’an, Shandong, China). A total of 21 patients (13 men and 8 women aging from 17 to 65 y, mean age 38.6 y) during active stage of psoriasis vulgaris who attended to the dermatological department of Tai’an City Central Hospital (Tai’an, Shandong, China) from 2010 Jan to 2011 Oct and fulfilled the following criteria were enrolled: (i) systemic application of tretinoin preparation, corticosteroid, or immunosuppressant has been withdrawn for recent 3 months; (ii) topical medicines have not been used to treat psoriasis for almost 1 month; (iii) patients have no other systemic or skin disease. Meanwhile, 18 healthy cohorts (11 men and 7 women aging from 24 to 66 y, mean age 36.1 y) were also recruited into this study. A spontaneously immortalized human keratinocyte HaCaT cell line was kindly provided by Doctor Ningning Dang (Dermatological department of Ji'nan Central Hospital, Ji’nan, Shandong, China). The cells were maintained in DMEM (Gibco, Carlsbad, CA, USA) supplemented with 10% fetal bovine serum (FBS, Hangzhou Sijiqing Bioengineering Material Co., Ltd., Hangzhou, Zhejiang, China) and antibiotics (100 mg/mL of ampicillin and 100 mg/mL of streptomycin, Lukang Shandong pharmaceutical Co., Ltd, Shandong, China). Cells were grown in a humidified atmosphere of 5% CO2 at 37°C, and the medium was changed after 48 h to remove non-adherent cells and renewed every other day. CGRP, CGRP8-37, PDTC, PD98059, and SB203580 were all purchased from Sigma Chemical Company (MO, USA). Cells were divided into four groups: (1) a control group, cells were cultured for 12 h without any stimulus; (2) CGRP group, cells were incubated with 10 nM CGRP for 12 h; (3) CGRP8-37 intervention group, cells were pretreated with 1 μM CGRP8-37 for 1 h before incubation with 10 nM CGRP for 12 h; (4) PD98059 group, cells were pretreated with 10 μM PD98059 for 1 h before a 12 h-CGRP incubation; (5) SB203580 intervention group, 10 μmol SB203580 pretreatment for 1 h was followed by a 12 h-CGRP incubation; (6) PDTC group, a one-hour-pretreatment with 0.1 M PDTC was prior to a 12 h CGRP incubation. 5 ml of peripheral blood collected from patients and healthy peers was transferred into a heparinized tube. All the blood was gently added on the top of 5 ml lymphocyte separation media (Sigma, USA) in a sterilized polystyrene tube, and the tube was centrifuged at 2000 rpm for 20 min at room temperature. After centrifugation, the Peripheral Blood Mononuclear Cells (PBMC) layer was collected and washed twice with PBS by centrifuging at 1500 rpm for 15 min and 1000 rpm for 10 min, respectively. Cells were resuspended in RPMI 1640 media (Sigma) and diluted to 1 × 107 cell/ml. Subsequently, a prepared nylon wool fiber column was soaked in prewarmed medium RPMI l640 media at 37°C for 30 min and rinsed with 5 ml of PBS, followed by 5 ml of RPMI l640 media containing 10% FBS. The column was incubated with 1ml of aforementioned lymphocyte suspension at 37°C for l h. After incubation, the column was washed twice with 5ml of RPMI l640 media preheated to 37°C, allowing an outflow of approximately 1 drop of liquid per second from the column. Finally, the elution solution enriching T lymphocytes was collected at a final concentration of l × 106 cell/ml. The T lymphocyte suspension was pretreated with 200 ng/ml Phytohemagglutinin (PHA) for 6 h prior to the chemotaxis assay. In brief, l × 105 T lymphocytes prepared as above were added to upper wells of 5.0 μm pore size, 24 well Transwell plates (No. CLS3421, Corning Costar, obtained through Sigma-Aldrich), while 100 μl of the supernatants of cultured HaCaT cells treated with different agents were added to the bottom wells. After a 6 h incubation at 37°C, migrated cells were fixed with methanol, followed by Gimsa staining. The chemotactic capacity was determined by Chemotactic Index (CI) indicating the ratio of migrated T lymphocyte population in samples to that in RPMI 1640 media devoid of HaCaT cell (Magnification, X400), which was used as a negative control. Cells were treated with different concentrations of CGRP (0, l, 10 nM) for 12 h and the content of released CCL27 in the supernatant was measured using a human CCL27 quantikine ELISA kit (R&D Systems China Col Ltd., Shanghai, China). 2 ng of anti-human CCL27 mAb (clone 124308) was applied to each well of a 96-well microplate (Corning Costar) and coated overnight at room temperature. Wells were then washed 4 times with PBS and blocked for at least 30 min with 200 μl of PBS containing 1% BSA (Sigma-Aldrich), followed by the addition of standard dilutions of recombinant CCL27 (1000, 500, 250, 125, 62.5, 31.2, and 0 pg/ml) and test samples and a 2 h incubated at 37°C. After washing 3 times with PBS, each well was incubated with 100 μL of biotinylated anti-human CCL27 polyclonal antibody (1:200) for 60 min and then washed 3 times. After staining with streptavidin-horseradish peroxidase (1:200) for 30 min, 100 μL of substrate working solution was added to each well and incubated for 15-20 min in the dark. The reaction was then stopped by the addition of 100 μL of 2 M H2SO4, and the OD450 was measured with a microplate reader (Model 550, Bio- Rad). Recombinant human CCL27 was used to prepare a standard curve. Data of CCL27 levels obtained from duplicate wells are presented as means ± SD. Quantitative PCR was carried out in a Rotor-Gene 3000 thermocycler (Corbett Research, Sydney, Australia) with the SYBR green probe (SYBR Premix Ex Taq™ II, Takara, Dalian, China). The amplification profile was one cycle at 94°C for 3 min, followed by 35 cycles of denaturation 94°C for 30 s, hybridization annealing at 53°C for 30 s, extension at 72°C for 50 s, followed by one extension cycle of 5 min at 72°C. PCR products were visualized on 1.2% (w/v) agarose gels stained with ethidium bromide. The mRNA levels were determined by measuring absorbance value using built-in Rotor-Gene software (Version. 6.0). The comparative Ct (2-ΔΔCt) method was introduced to calculate the relative-fold changes of mRNA expression. All reactions were performed in triplicate, and values reported are means ± SD. For the evaluation of the effects of CGRP stimulation, cells were incubated with 10 nM CGRP and western blot assay was conducted at various time intervals (0, 5, 10, 30 and 60 min). Cultures were washed twice with ice-cold PBS, and sequentially harvested cells were pelleted and resuspended in lysis buffer containing 1% PMSF protease inhibitor (Sigma), followed by incubating on ice for 30 min. Lysates were subjected to ultrasonicated on ice for further lysing and centrifuged at 15,000 rpm for 5 min at 4°C. After centrifugation, protein supernatant was kept at -80°C for future analysis. For immunoblotting, 20 μg protein samples were separated on 10% SDS-PAGE and transferred to PVDF membranes at 250 mA for 1 h at 4°C. The membranes were blocked with 5% non-fat milk and then incubated overnight at 4°C with mouse monoclonal primary antibodies against human phosphorylated p38 (p-p38, 1:100 diluted, Santa Cruz Biotech, Inc., Santa Cruz, CA, USA), p-ERK1/2 (1:100, Santa Cruz Biotech, Inc.), IκB-α (1: 200, Santa Cruz Biotech, Inc.), or β-actin (1:300, Santa Cruz Biotech, Inc.), followed by rinsing 3 times with PBST for 15 min, and subsequently incubated with HRP-conjugated secondary goat anti- mouse IgG (1: 2000, Beijing Solarbio science and technology Co., Ltd. Beijing, China) or goat anti-rabbit IgG (1:2000, Beijing Solarbio science and technology Co., Ltd) at room temperature for 1 h. Then, the membrane was washed with PBST for three times (5 min per time) before photographed using ECL reagents (Millipore, Billerica, MA, USA). All data were presented as mean ± Standard Deviation (SD). Significance between various treatment samples was calculated by Student’s t-test for two group comparisons or One-Way Analysis of Variance (ANOVA) when more than two groups were compared. All tests performed were two-sided. Differences between the mean values were evaluated with a minimal significance of P-values<0.05. All statistical analyses were carried out using the SPSS17.0 software (SPSS, Inc., Chicago, IL, USA). Psoriasis is an inflammatory skin disease involving a series of immune processes, thus we first evaluated the effect of CGRP on psoriasis pathogenesis by performing chemotaxis assay. HaCaT is an immortal keratinocyte cell line derived from adult human skin and generally used as a paradigm for pharmacological testing of anti-psoriasis activities in vitro . We cultured HaCaT cells in vitro in the presence of different agents, prior to collection of the culture supernatants. As shown in Figure 1A, Chemotactic Index (CI) of T lymphocytes from patients with psoriasis was higher in comparison to the healthy peers (P<0.05) under the same external stimulus condition, which indicated that an increase in lymphocyte chemotactic capacity is tightly related to psoriasis onset. 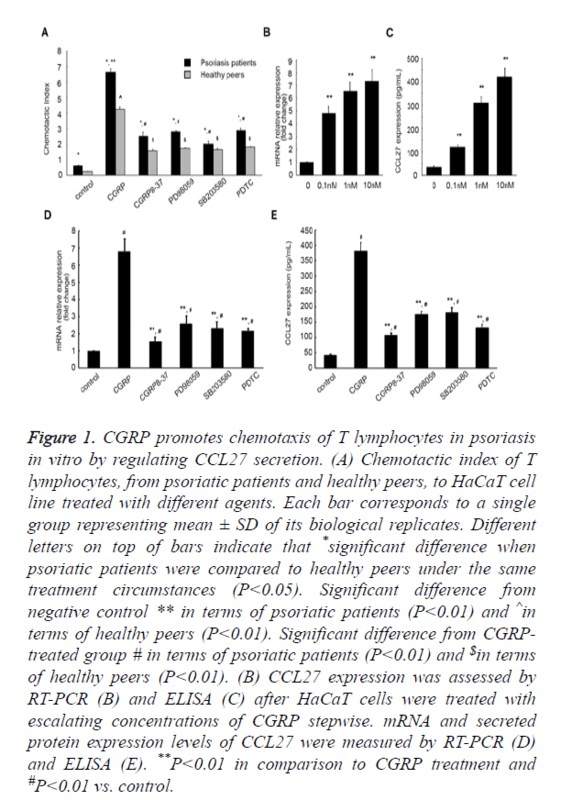 On incitement of CGRP, CI of T lymphocytes from psoriatic patients markedly increased from 0.62 ± 0.03 to 6.65 ± 0.21 (P<0.01). However, the introduction of a CGRP receptor antagonist CGRP8-37 compromised this augment, CI decreasing to 2.52 ± 0.26 (P<0.01, Figure 1A). Of note, the addition of a specific p38-MAPK pathway inhibitor SB203580, ERK 1/2 pathway inhibitor PD98059, or a NF-κB inhibitor Pyrrolidine Dithiocarbamate (PDTC) could also weaken the augment in T lymphocyte CI induced by CGRP (6.65 ± 0.21 vs. 2.02 ± 0.17, 6.65 ± 0.21 vs. 2.82 ± 0.05, 6.65 ± 0.21 vs. 2.89 ± 0.14, respectively). Similar results were observed in the T lymphocytes isolated from the healthy cohorts. Culture supernatants of HaCaT cells that were incubated with CGRP significantly aggrandized CI of lymphocytes from 0.24 ± 0.01 to 4.25 ± 0.16 (P<0.01), and the addition of SB203580, PD98059, or PDTC decreased the augment caused by CGRP (4.25 ± 0.16 vs. 1.57 ± 0.11, 4.25 ± 0.16 vs. 1.65 ± 0.08, 4.25 ± 0.16 vs. 1.74 ± 0.03, 4.25 ± 0.16 vs. 1.82 ± 0.04, respectively, P<0.01). These in aggregate suggested that CGRP treatment enhanced the chemotactic activity of T lymphocytes, dependent on MAPK and NF-κB signaling pathways. Figure 1. CGRP promotes chemotaxis of T lymphocytes in psoriasis in vitro by regulating CCL27 secretion. (A) Chemotactic index of T lymphocytes, from psoriatic patients and healthy peers, to HaCaT cell line treated with different agents. Each bar corresponds to a single group representing mean ± SD of its biological replicates. Different letters on top of bars indicate that *significant difference when psoriatic patients were compared to healthy peers under the same treatment circumstances (P<0.05). Significant difference from negative control ** in terms of psoriatic patients (P<0.01) and ^in terms of healthy peers (P<0.01). Significant difference from CGRPtreated group # in terms of psoriatic patients (P<0.01) and $in terms of healthy peers (P<0.01). (B) CCL27 expression was assessed by RT-PCR (B) and ELISA (C) after HaCaT cells were treated with escalating concentrations of CGRP stepwise. mRNA and secreted protein expression levels of CCL27 were measured by RT-PCR (D) and ELISA (E). **P<0.01 in comparison to CGRP treatment and #P<0.01 vs. control. Next, we attempted to explore the mechanism underlying CGRP exerting its biological effects on T lymphocyte chemotaxis. As CCL27 is a skin-specific chemokine mainly secreted by human keratinocytes, playing a pivotal role in establishing the inflammatory infiltrate characteristic for inflammatory skin diseases, and CCL27 expression can be induced by TNF-α and IL-1β , we rationally speculated that CGRP might affect the chemotaxis of T lymphocytes via inducing the secretion of CCL27 in HaCaT cells. We therefore profiled the expression pattern of CCL27 in HaCaT cells upon treatment varying concentrations of CGRP by performing quantitative Reverse Transcription-PCR (RT-PCR). In the presence of escalating concentrations of CGRP stepwise, CCL27 mRNA expression considerably increased (P<0.01, Figure 1B). Moreover, as the CGRP concentration elevated, the amount of CCL27 mRNA aggrandized, and the maximum amount was achieved with 10 nM of CGRP. This was further corroborated by ELISA assessing CCL27 protein released from HaCaT cells into the supernatants of cell cultures. It was shown that CGRP incitement significantly up-regulated CCL27 expression in the culture supernatants of HaCaT cells, and more CCL27 protein was released from cells incubated with higher concentration of CGRP than that treated with lower concentration (P<0.01, Figure 1C), with 10 nM of CGRP facilitating the peak secretion of CCL27 protein, strongly consisted with the qPCR results. To further verify the facilitative effect of CGRP on CCL27 expression, we subsequently measured the mRNA and secreted protein products of CCL27 after the introduction of CGRP8-37, as well as PD98059, SB203580, and PDTC. As summarized in Figure 1D, CCL27 mRNA expression augment induced by CGRP was dramatically compromised, with the fold change (the ratio of CCL27 mRNA from different groups to the control group that was cultured in absence of any agent) decreasing from 6.81 ± 0.72 to 1.56 ± 0.24, 2.59 ± 0.45, 2.32 ± 0.37, 2.17 ± 0.13, respectively (P<0.01, Figure 1D). Also, the CCL27 protein yield was markedly reduced by CGRP8-37, PD98059, SB203580, and PDTC from 380.76 ± 28.54 to 106.34 ± 8.12, 174.31 ± 10.09, 180.53 ± 16.49, 130.67 ± 11.49 pg/ml (P<0.01, Figure 1E). All these data manifested that CGRP induced the secretion of CCL27 in HaCaT cells in a MAPK- and NF-κB-dependent manner, although the potential signaling processes resulting in this increased secretion remains to be deciphered. It is recognized that CGRP can resort to the activation of MAPK and NF-κB pathways for the sake of the participation in neuroinflammation, thus we assessed two canonical MAPK pathways as well as NF-κB signaling. HaCaT cells were incubated with 10 nM of CGRP for various time intervals (5, 10, 30, 60 min), prior to measuring the phosphorylation status of p38 and ERK1/2. At the beginning, we found that p38 protein displayed moderate phosphorylation, whereas the phosphorylated p38 (p-p38) obviously expressed on CGRP treatment for merely 5 min, and gradually weakened with time lapse (Figure 2A). Similar results were observed in the phosphorylation pattern of ERK1/2, which exhibited the most intensive signal with a 10 min-CGRP treatment and then faded as the treatment duration extended. These indicated that the phosphorylation of p38 and ERK1/2, indicative of activation of two canonical MAPK pathways, occurs in the early stage of CGRP-induced psoriatic progression. Figure 2. 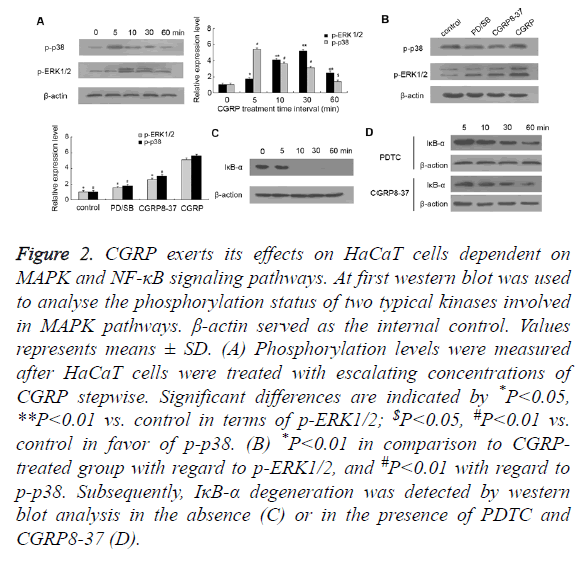 CGRP exerts its effects on HaCaT cells dependent on MAPK and NF-κB signaling pathways. At first western blot was used to analyse the phosphorylation status of two typical kinases involved in MAPK pathways. β-actin served as the internal control. Values represents means ± SD. (A) Phosphorylation levels were measured after HaCaT cells were treated with escalating concentrations of CGRP stepwise. Significant differences are indicated by *P<0.05, **P<0.01 vs. control in terms of p-ERK1/2; $P<0.05, #P<0.01 vs. control in favor of p-p38. (B) *P<0.01 in comparison to CGRP treated group with regard to p-ERK1/2, and #P<0.01 with regard to p-p38. Subsequently, IκB-α degeneration was detected by western blot analysis in the absence (C) or in the presence of PDTC and CGRP8-37 (D). The blockage of p38-MAPK and ERK1/2 pathways was fulfilled by the pretreatment of HaCaT cells with a specific p38 inhibitor SB203580 and ERK 1/2 inhibitor PD98059, respectively (Figure 2B). As expected, SB203580 or PD98059 pretreatment substantially decreased the phosphorylated p38 and ERK1/2. Importantly, CGRP8-37 inhibiting the activity of CGRP ultimately reduced the phosphorylation status of p38 and ERK1/2 compared to CGRP-treated HaCaT cells. These data together suggested that CGRP promoted the secretion of chemokine CCL27, which is involved in the regulation of T cell-mediated skin inflammation and in particular, in a MAPK-dependent manner. On the other hand, IκB-α is a cellular protein that inhibits NF- κB signaling by masking the Nuclear Localization Signals (NLS) of NF-κB proteins and retaining them sequestered in an inactive state in the cytoplasm, whilst blocking the ability of NF-κB transcription factors to bind with DNA, which is required for NF-κB functioning. In this study, we found that IκB-α was prominently expressed in HaCaT cells cultured in vitro, while a 10 min treatment with CGRP resulted in the initiation of IκB-α degradation (shown in Figure 2C). Also as shown in Figure 2D, pretreatment of HaCaT cells with NF-κB inhibitor PDTC rescued otherwise faint IκB-α expression caused by CGRP, suggesting that barely detectable IκB-α is a hallmark for activation of NF-κB signaling pathway, which is also deemed as an early event in CGRP-stimulated psoriasis pathogenesis. Remarkably, pre-incubation with CGRP8-37 also prevented IκB-α from degrading and suppressed the activation of NF-κB signaling pathway, which indicated that NF-κB pathway also plays a crucial role in CGRP-regulated psoriatic process. Aberrant activation of MAPK pathways is closely associated with psoriasis onset and, in response to CGRP, the proliferation of vascular endothelium and keratinocyte is accelerated, which is mediated by phosphorylation of ERK1/2 and p38 MAPK. The endothelial proliferation can lead to psoriatic microvascular expansion [32,33]. In this report we demonstrated another role of MAPK pathways in CGRPfacilitated psoriatic progression. Taken together, these results suggest that CGRP modulates T lymphocyte chemotaxis by promoting CCL27 secretion from keratinocytes. Furthermore, this study provides considerable evidence suggesting the involvement of two canonical MAPK signaling pathways including p38-MAPK and ERK1/2 pathways as well as NF-κB in CGRP-induced CCL27 increase. Besides, our results indicate that MAPK pathways coupled with IκB-α, a key cellular protein in NF-κB signaling, may act as candidate molecular targets in clinical treatment of psoriasis. This work was supported by Tai’an Science and Technology Development Project (Grant No. 201340629). Parisi R, Symmons DP, Griffiths CE, Ashcroft DM. Identification and Management of Psoriasis and Associated ComorbidiTy (IMPACT) project team. Global epidemiology of psoriasis: a systematic review of incidence and prevalence. J Invest Dermatol 2013; 133: 377–85. Boehncke WH, Schon MP. Psoriasis. Lancet 2015; 386: 983-994. Questions and Answers about Psoriasis. National Institute of Arthritis and Musculoskeletal and Skin Diseases 2013. Menter A, Gottlieb A, Feldman SR, Van Voorhees AS, Leonardi CL, Gordon KB, Lebwohl M, Koo JY, Elmets CA, Korman NJ, Beutner KR, Bhushan R. Guidelines of care for the management of psoriasis and psoriatic arthritis: Section 1. Overview of psoriasis and guidelines of care for the treatment of psoriasis with biologics. J Am Acad Dermatol 2008; 58: 826-850. Morales J, Homey B, Vicari AP, Hudak S, Oldham E. CTACK, a skin-associated chemokine that preferentially attracts skin-homing memory T cells. Proc Natl Acad Sci USA 1999; 96: 14470-14475. Kakinuma T, Saeki H, Tsunemi Y. Increased serum cutaneous T cell-attracting chemokine (CCL27) levels in patients with atopic dermatitis and psoriasis vulgaris. Allergy Clin Immunol 2003; 111: 592-597. Campanati A, Goteri G, Simonetti O, Ganzetti G, Giuliodori K. CTACK /CCL27 expression in psoriatic skin and its modification after administration of etanercept. Br J Dermatol 2007; 157: 1155-1160. Farber EM, Nickoloff BJ, Recht B, Fraki JE. Stress, symmetry, and psoriasis: possible role of neuropeptides. J Am Acad Dermatol 1986; 14: 305-311. Farber EM, Nall ML. The natural history of psoriasis in 5,600 patients. Dermatologica 1974; 148: 1-18. Payan DG, Levine JD, Goetzl EJ. Modulation of immunity and hypersensitivity by sensory neuropeptides. J Immunol 1984; 132: 1601-1604. Perlman HH. Remission of psoriasis vulgaris from the use of nerve-blocking agents. Arch Dermatol 1972; 105: 128-129. Ostrowski SM, Belkadi A, Loyd CM, Diaconu D, Ward NL. Cutaneous denervation of psoriasiform mouse skin improves acanthosis and inflammation in a sensory neuropeptide-dependent manner. J Invest Dermatol. 2011; 131: 1530-1538. Rosenfeld MG, Mermod JJ, Amara SG, Swanson LW, Sawchenko PE. Production of a novel neuropeptide encoded by the calcitonin gene via tissue-specific RNA processing. Nature 1983; 304: 129-135. Brain SD, Williams TJ, Tippins JR, Morris HR, Macintyre I. Calcitonin gene-related peptide is a potent vasodilator. Nature 1985; 313: 54-56. Brain SD, Williams TJ. Inflammatory oedema induced by synergism between calcitonin gene-related peptide (CGRP) and mediators of increased vascular permeability. Br J Pharmacol 1985; 86: 855-860. Durham PL. Calcitonin gene-related peptide (CGRP) and migraine. Headache 2006; 46: 3-8. Seike M, Ikeda M, Morimoto A. Increased synthesis of calcitonin gene-related Peptide stimulates keratinocyte proliferation in murine UVB-irradiated skin. J Dermatol Sci 2002; 28: 135-143. Gomes RN, Castro-Faria-Neto HC, Bozza PT, Soares MB, Shoemaker CB, David JR, Bozza MT. Calcitonin gene-related peptide inhibits local acute inflammation and protects mice against lethal endotoxemia. Shock 2005; 24: 590-594. Ganor Y, Drillet-Dangeard AS, Lopalco L, Tudor D, Tambussi G. Calcitonin gene-related peptide inhibits Langerhans cell-mediated HIV-1 transmission. J Exp Med 2013; 210: 2161-2170. Granstein RD, Wagner JA, Stohl LL, Ding W. Calcitonin gene-related peptide: key regulator of cutaneous immunity. Acta Physiol (Oxf) 2015; 213: 586-594. Reich A, Orda A, Wisnicka B.Plasma concentration of selected neuropeptides in patients suffering from psoriasis.Exp Dermatol 2007; 16: 421-428. Chu DQ, Choy M, Foster P. A comparative study of the ability of calcitonin gene-related peptide and adrenomedullin (13-52) to modulate microvascular but not thermal hyperalgesia responses. Br J Pharmacol 2000; 130: 1589-1596. He Y, Ding G, Wang X, Zhu T, Fan S. Calcitonin gene-related peptide in Langerhans cells in psoriatic plaque lesions. Chin Med J (Engl) 2000; 113: 747-751. Barwell J, Wheatley M, Conner AC, Taddese B, Vohra S. The activation of the CGRP receptor. Biochem Soc Trans 2013; 41: 180-184. Poyner DR, Sexton PM, Marshall I, Smith DM, Quirion R. International Union of Pharmacology. XXXII. The mammalian calcitonin gene-related peptides, adrenomedullin, amylin, and calcitonin receptors. Pharmacol Rev 2002; 54: 233-246. Vause CV, Durham PL. CGRP Stimulation of iNOS and NO release from trigeminal ganglion glial cells involves MAP kinase pathways. J Neurochem 2009; 110: 811-821. Durham PL, Russo AF. Stimulation of the calcitonin gene-related peptide enhancer by mitogen-activated protein kinases and repression by an antimigraine drug in trigeminal ganglia neurons. J Neurosci 2003; 23: 807-815. Wang Z, Ma W, Chabot JG, Quirion R. Calcitonin gene-related peptide as a regulator of neuronal CaMKII-CREB, microglial p38-NFkappaB and astroglial ERK-Stat1/3 cascades mediating the development of tolerance to morphine-induced analgesia. Pain 2010; 151: 194-205. Millet I, Phillips RJ, Sherwin RS, Ghosh S, Voll RE. Inhibition of NF-kappaB activity and enhancement of apoptosis by the neuropeptide calcitonin gene-related peptide. J Biol Chem 2000; 275: 15114-15121. Ding W, Wagner JA, Granstein RD. CGRP, PACAP, and VIP modulate Langerhans cell function by inhibiting NF-kappaB activation. J Invest Dermatol 2007; 127: 2357-2367. Stein M, Bernd A, Ramirez-Bosea A. Measurement of anti-inflammatory effects of glueoeortieoids on human keratinoeytes in vitro. Comparison of normal human keratinocytes with the keratinocyte cell line HaCaT. Arzneimittel Forsehung 1997; 47: 1266-1270. Yu XJ, Li CY, Xu YH, Chen LM, Zhou CL. Calcitonin gene-related peptide increases proliferation of human HaCaT keratinocytes by activation of MAP kinases. Cell Biol Int 2009; 33: 1144-1148. Creamer D, Allen MH, Sousa A, Poston R, Barker JN. Localization of endothelial proliferation and microvascular expansion in active plaque psoriasis. Br J Dermatol 1997; 136: 859-865.